Here's some Delphi code that allows you to create any ActiveX control at runtime. You can also set and get properties and call methods. I originally got this idea and some of the code from a magazine article, but I can't remember which magazine. A guy called Jay Cherrabi has also helped out with the code and got me motivated to actually upload it here. This class provides a list of the ActiveX controls that the registry says are installed on your system. There are properties providing the ClassID, ProgID, description and filename of each control. In some cases, your registry will contain entries for non-existent controls, so this list may be incorrect. This class acts as the host for the ActiveX control. 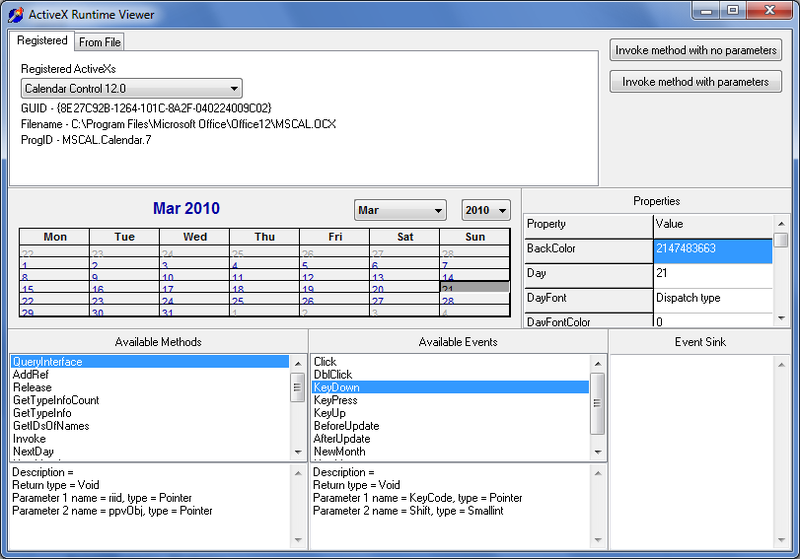 It provides a list of the available properties, methods and events. It allows you to get and set properies, call methods and sink events via the OnEvent event handler. Now will also allow you to create a control that isn't registered via the filename and the GUID.